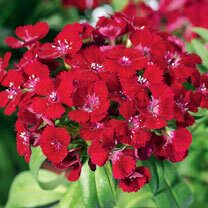 Sweet William/Dianthus Barbarini Red -This new strain has been developed to produce stunning red fragrant flowers right from the first year which has been a slight drawback with many previous varieties. 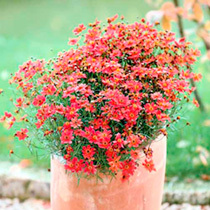 A compact form that will look lovely towards the front of a border or in a patio container for summer colour. Height 20-30cm (8-12"). Suitable for cutting. Dianthus Passion - From arguably the world’s finest dianthus breeder, Whetmans, this amazing fragrant, floriferous and compact variety has velvety red fragrant flowers, a really long flowering period, compact habit and beautiful shape. Flowers May-July. Height 20-30cm (8-12"). Dahlia Dreamy Lips - An eye catching bright red flowering variety from a new range of compact dahlias with bronze foliage and contrasting flower colours which will continue to produce fresh blooms throughout the summer. Flowers May-October. Height 30-40cm (12-16"). 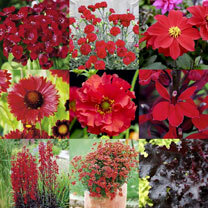 Gaillardia Mesa Red - The bright red flowers of this form start early and are produced in great profusion. 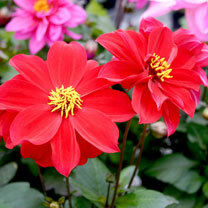 Large saucer-shaped flowers with red tubular flowers all around the edge pointing outwards with a dark pin cushion-like centre. Geum Red Dragon - Frilly flowers of hot orange and red. Longer-blooming than most, especially if dead blooms are removed. These pretty flowers bloom year after year without any work on your part! The robust, drought-tolerant plants produce compact mounds of glossy foliage topped with panicles of flowers throughout spring and summer. The evergreen or semi-evergreen leaves provide attractive ground cover all winter too! Flowers May-August. Height 40-50cm (16-20"); spread 30-40cm (12-16"). Lobelia Princess Scarlet - Scarlet-red. A cutting-raised version of this popular lobelia, producing compact, bushy clumps of dark foliage and tall flower spikes. Very free flowering. Flowers July-September. Height 50-60cm (20-24"); spread 30-40cm (12-16"). Middle of border variety. 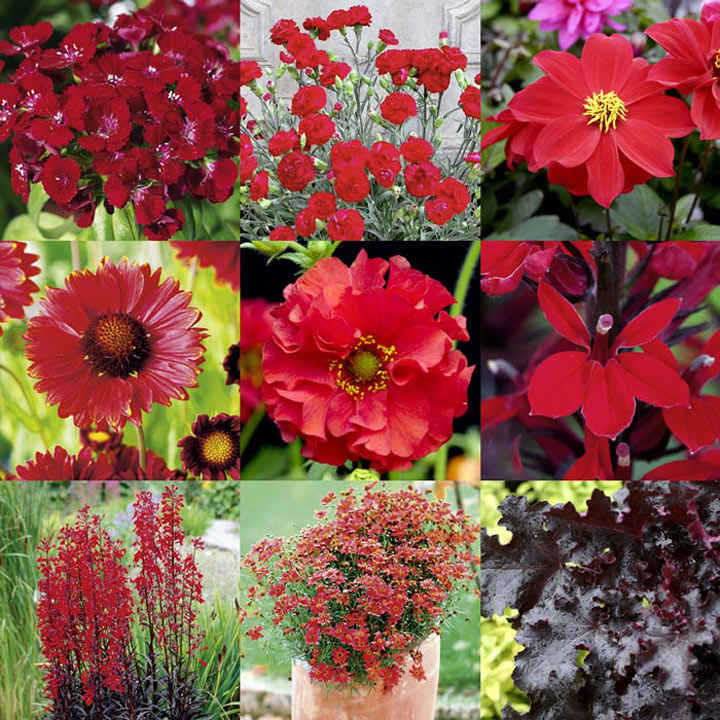 Lobelia Queen Victoria - Turn up the heat in borders with Queen Victoria's scarlet red flowers, which are set off to perfection against deep bronze foliage. It makes a lovely cut flower too. Flowers July-August. Height 75cm (30"). Back of border variety. Suitable for cutting. 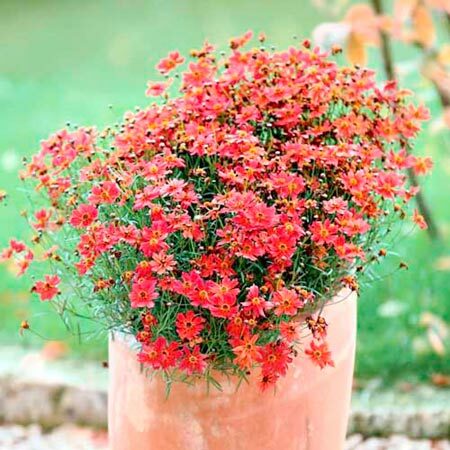 Coreopsis Rum Punch - An eyecatching and striking coloured variety with deep orange, pink blooms which are produced in huge quantities in mounds throughout the whole summer. Flowers June-August. Height 30-40cm (12-16"); spread 30-40cm (12-16"). Heuchera Black Beauty - Glossy, deep red-purple leaves with a very ruffled edge that gives an added dimension. Must-have hardy perennial, with the most unusual foliage. The plumes of little flowers that appear in summer are an added bonus! Height 20-35cm (8-14"); spread 30-50cm (12-20"). Suitable for cutting. Ideal for beds and borders, patio pots and containers, rockeries. Attractive to bees. Prefers full sun or partial shade.